Avalon continues to increase its versatility in home heating, this time electrically with the Seattle Electric fireplace. With no need for a chimney, vent or gas access; the only thing needed to fuel the Seattle E is a standard 110 volt wall outlet. When it comes to the golden flame, Avalon's high quality craftsmanship burns brightly demonstrating the latest in fireplace technology. An enticing, life- like fire dances behind 564 square inches of high clarity glass. Small lights are built into the log set as well as ember bed giving it a lively, pulsating appearance simulating a burning coal bed. The Purefire Clean Air System is featured with the Seattle E as an upgrade option. This system purifies the air in an average room four times per hour, re-circulating it each time a little cleaner. The Purefire System along with the power, sleep timer, room temperature, flame speed and interior accent light can all be operated from a hand held remote control. A built in heater and circulating fan is available as an upgrade option distributing up to 5,000 Btu's with the capacity to heat up to 400 square feet. The feature makes the Seattle E ideal for zone heating offices, bedrooms and other small spaces. Upgrade your life and style with the Seattle Electric. 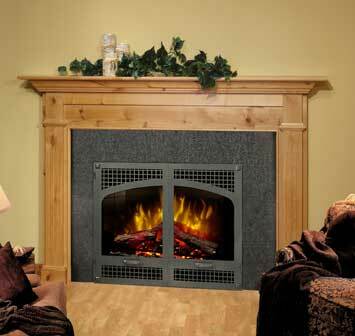 Now add the beauty and convenience of the Seattle E into an existing fireplace. The NEW 8" Panel Set allows you to convert the Seattle E into an insert that is designed to fit most masonry or ZC fireplaces.